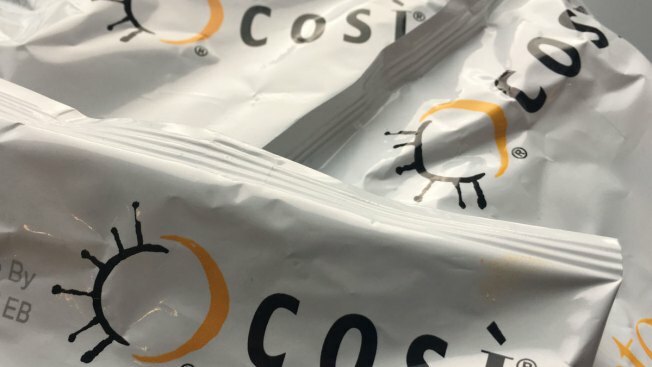 The Cosi logo on bags of potato chips photographed on Wednesday, Sept. 28, 2016 in New York. Cosi, the restaurant chain known for its flatbread sandwiches, said it filed for Chapter 11 bankruptcy protection Wednesday and is seeking to sell itself to its lenders. The company has closed 29 stores, but said the remaining 76 Cosi restaurants located around the country will remain open as it goes through the bankruptcy process. In court documents, Cosi Inc. said it has between $10 million and $50 million in assets and the same amounts in debt. Last month, the company reported a second-quarter loss of $3.1 million after reporting a loss of $3.8 million in the same period a year before. Cosi hasn't reported an annual profit since at least 1998, according to data provider FactSet. The chain went public in 2002. Cosi said that its lenders AB Opportunity Fund, AB Value Partners and firms connected to Milfam, are providing a $4 million loan to keep Cosi running. Those lenders also plan to bid to buy all of Cosi's assets in a bankruptcy auction, the Boston-based company said. Besides sandwiches, Cosi serves soups, flatbread pizzas and salads at its eateries.